This study from the Johns Hopkins Bloomberg School of public Health suggests 86 percent of Americans could be overweight or obese by 2030. A stunning, yet not altogether surprising, ascertation. Just look around you, at what you see day-to-day. I happen to live in North Carolina, a state which has rolled-up its sleeves to help the South earn this little bit of dubious notoriety. Good God I reckon, as we’re apt to mutter, when confronted with such nonsense, down here in Dixie. Now, it’s obvious (or damn well ought to be ) to the most casual observer that something in our society has gone terribly amiss. 86 percent of the population overweight or obese by 2030? Are you kidding me? You’d think those suits in a power position — those with the utmost ability to affect public discourse in this arena — would realize that the government-backed diet prescription of the last 60-odd years is — to say the very least — is a tad bit flawed. Apparently not, though. Judging from the likes of such discourse as this, the establishment seems quite all right with the present course. 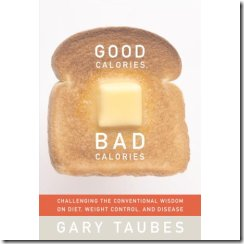 I don’t agree with everything that Gary Taubes has to say in Good Calories, Bad Calories; for instance, I believe that he fails to acknowledge the contribution of exercise (via positive hormonal/gene expression) as part of a balanced weight control effort. However, he otherwise presents a compelling case against the prevailing diet “knowledge pool” and official government policies of the last 60-odd years. Empirically speaking, I can attest to the fact that what he’s promoting in this book — basically, a low-carbohydrate diet — is an effective weapon against body fat (and water retention, for that matter). It is my personal belief that this type of diet is also healthier hormonally. I wish that, for the sake of our society’s health, the “powers that be” would at least acknowledge that the diet theory they’ve been promoting for the last 60-odd years is dead wrong. Hell, they don’t even have to roll-over in submission at the feet of Mr. Taubes. We can dismiss with the (much deserved as it might be) tar and featherings. But for God’s sake, at least remain silent so that the dogma of the high-carb, low-fat “diet pyramid” might finally be allowed die a natural, long overdue death.